Celebrating 30 Years Various Artists July 2–28 Mixed media invitational exhibition featuring West Vancouver artists who have previously exhibited in the Gallery. Opening reception is on Tuesday, July 2, 6–8 p.m. Meet the Artists: Saturday, July 6, 13 & 20, 2–3 p.m. Admission to all exhibits and openings is free and open to the public. 37 confirmed artists for the exhibition including Xwalacktun, Cori Creed, AaronNelson Moody (Splash), Ross Penhall, Pierre Coupey, Peter Kiss, Jane Clark. SPONSOR BENEFITS •Verbal acknowledgment of BPP sponsorship at the opening reception. 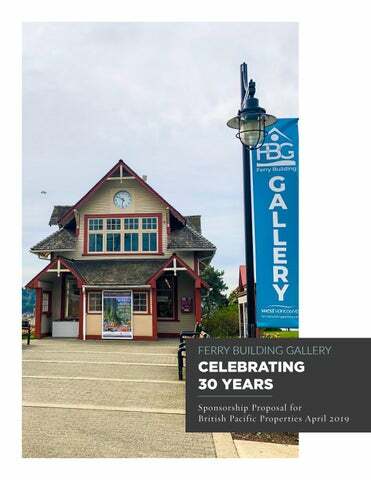 •Signage in the Ferry Building Gallery recognizing British Pacific Properties as the exhibition sponsor. •Opportunity to speak at the opening reception. •Print exposure: Branding will appear on all Ferry Building postcards, posters, exhibition signage and print materials. •Online exposure: Branding included on all Ferry Building Gallery social media and web materials.